During World War II, why did the Japanese refuse orders from Nazi Germany, its wartime ally, to kill all the Jews within its borders? A new book from Academic Studies Press, “Under the Shadow of the Rising Sun: Japan and the Jews during the Holocaust Era” addresses this question. Its author, Dr. Meron Medzini, former director of Israel’s Government Press Office (GPO) and also the author of “Golda Meir: A Political Biography,” was born in 1932. After working as spokesman at the GPO for the prime ministers Levi Eshkol, Golda Meir, and Yitzhak Rabin, Dr. Medzini taught modern Japanese history in the Department of Asian Studies of the Hebrew University of Jerusalem and Israeli foreign policy at the Rothberg International School of the Hebrew University. 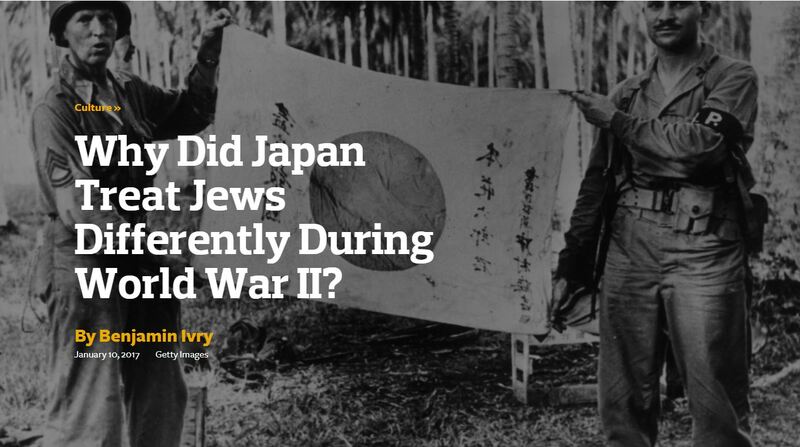 Recently, “The Forward’s” Benjamin Ivry discussed with Dr. Medzini the subtleties and complexities of Japanese policies towards Jews before and during the Second World War. Benjamin Ivry: You write that although Jews in areas occupied by Japan during World War II were brutalized, they did not suffer because they were Jewish — does it matter to people being abused by an occupying power why they are being abused? Meron Medzini: No, but the basic idea was to show the difference between the Japanese and the Nazis, and the second thing was that any dealing with Jews was essentially left to the local commander, be it the camp leader or division head. There was no clear-cut guidance from Tokyo, to do this or that to the Jews. The Jews were considered part of the gaijin, the foreigners. Was the Japanese-Jewish common ancestry theory, which appeared in the 1600s as a hypothesis claiming that Japanese people belonged to the ten lost tribes of Israel, widely known enough to have influenced people’s beliefs in Japan? Not at all. The people who spread this essentially were Christians. The average Japanese scholar was not interested in it, did not know about it, did not read or write about it. The Japanese were skeptical of Nazi racial theories, insofar as Asians were described as inferior to Aryans in Hitler’s “Mein Kampf,” even if its Japanese translation deleted such references, right? The few Japanese who read “Mein Kampf” in the original were aware of it. Some Japanese journalists knew of it in the 1930s. I am not aware that Japanese intellectuals ever brought up this idea. The Germans, in all their contacts with the Japanese, tried to downplay the [Nazi] idea that [Asian] races were inferior and destroyers of civilization. In Japan, a ministerial resolution of 1938 ordered officials to not alienate America and follow the so-called Japanese “policy of racial tolerance” rather than German and Italian anti-Semitic measures. Since Japan was capable of racism against its own minority populations as well as Chinese, Koreans, and Southeast Asians, was their self-image as tolerant justified or realistic? I don’t know, it was probably realistic. Justified, I am not sure. Especially if we remember what they did to the Chinese not just in Nanjing but in other places. What they felt about the Jews was, “Let’s treat them like other foreigners.” On the one hand they feared the Jews because they saw how many Jews were involved in the Russian Revolution and the early days of the Soviet government. Also, they did not want to alienate the Americans. They had a good relationship with [the banker] Jacob Schiff, who bailed them out [by helping finance Japanese military efforts against Tsarist Russia in the Russo-Japanese War]. There was admiration of the Jews, but also fear. The Japanese cult for classical music made Nippon Columbia Records ignore Nazi requests to destroy recordings by Jewish musicians, and in Japan, European Jewish musicians were generally undisturbed during the war. Yet the touring violinist Szymon Goldberg and pianist Lili Kraus, suffered internment in Java. How to explain respecting Jewish musicians in wartime Japan, while imprisoning those in Japanese colonies? The colonies were a different story. The home country is one thing. Jews who lived in Japan, mainly in Tokyo, were not interned. Only in the last few months of the war were foreigners interned near Tokyo, although this was not in an internment camp and the foreigners preferred to leave Tokyo, which was destroyed by big bombing raids. It is suggested that the Nazis did not share the details of the Final Solution with Japan, their ally. Weren’t they proud of the Holocaust? They were not proud of the Holocaust and B) the alliance was basically on paper. There was basically no military cooperation; there was an advanced cultural gap. The Germans did not even tell the Japanese they were going to attack the Russians, so it was a very strange alliance. In Japanese-occupied Penang, Malaysia and elsewhere in Asia, Jews had to wear armbands with the word “Jew” written in Japanese. Even if this did not lead to immediate execution, it seems to contradict the notion that the Japanese bore no grudge against the Jews. Probably it was at the instigation of local elements, either Chinese or Muslims. They were dealing with a tiny number of Jews, because the majority of the Jews of Penang had been evacuated by the British and taken to Singapore, so this was a rare case, absolutely rare. If the desire to profit from the presence of wealthy Jewish businesspeople and nervousness about post-war retribution played a role in the Japanese decision not to exterminate Jews, were Japan’s relatively humane policies motivated by greed and fear? More by fear than by greed. Was anti-Semitic propaganda that Jews control the world a blessing in disguise, intimidating the Japanese military into thinking that killing Jewish civilians would have post-war repercussions? How did the Japanese reconcile views published by Russian anti-Semites that Jews were Marxist, Bolshevik agitators responsible for political unrest with the fact that most Jews living in Asia were merchants, doctors, or lawyers, not full-time political agitators? They did not write about this or discuss this in any official manner. They made a number of key decisions about what to do with the Jews, that they would not be singled out for any special treatment, but they should be watched, to keep an eye on them. Totally unlike the Final Solution of Nazi Germany. You suggest that Chiune Sugihara, a Japanese diplomat who served as Japanese Vice-Consul in Lithuania, does not qualify as a Righteous Gentile, an honor he received from Israel in 1985, as he did not risk his life or suffer professionally for issuing transit visas in 1940. Should the title of Righteous Gentile be rescinded? No, it should not be taken away, because Sugihara did go out of his way to help. He was very convenient for the government of Israel [around 1985]. The title should be viewed in the background of strained Israel-Japanese relations for the first forty years of our ties. Japan had pursued a clear policy of adhering to the Arab economic boycott of Israel, mainly because of their dependence on Arab oil. For Israel, it was important to demonstrate to the Japanese that at least one of them did something decent and humane. Israel wanted to show that we appreciate what a single Japanese did, even though he granted these visas before the decisions of the Holocaust were made. I personally met Sugihara when he came to Israel in 1968 or 1969; he was a very quiet, thoughtful, reflective man who was quite pleased that someone finally recognized him. Your colleague the historian Ben-Ami Shillony has explored how the Jews and Japanese were seen by the world in the early 1900s as “flourishing infidels,” rejecting Christianity and asserting themselves in scientific and other pursuits. Did wartime Japanese observers see a somewhat distorted mirror image of themselves when looking at Jews, or was this viewpoint limited to those who hated them both? Basically I would go along with Shillony, if only for the reason that he was my student. He is a top-notch Japanologist, highly respected world-wide. You have to bear in mind that most Japanese had never seen a Jew in their lives. There were maybe a thousand Jews in Japan in the 1930s, so most could not tell them from other foreigners. My motive in writing this book was to tell [readers] that the Holocaust was not only in Europe, but in North Africa to a limited extent, and also in Asia.